Healthcare Archives - Welcome to PT2Go! Healthcare Archives - Welcome to PT2Go! New York, NY November 8, 2016, Election Night, changed the world as we know it. This forum isn’t to comment on if that change was for the better or worse. This is a safe space to comment on how this change effects us ALL in healthcare. For those of us who work in healthcare, law enforcement, or education, our jobs are to care for the ones we took an oath for to “do no harm” and keep people safe in an unbiased form. I’ll choose to wear a safety pin for solidarity for the people of my generation who are living in fear for the first time in our lives- LGBTQ, minorities, women and anyone else who feels threatened or unsafe. 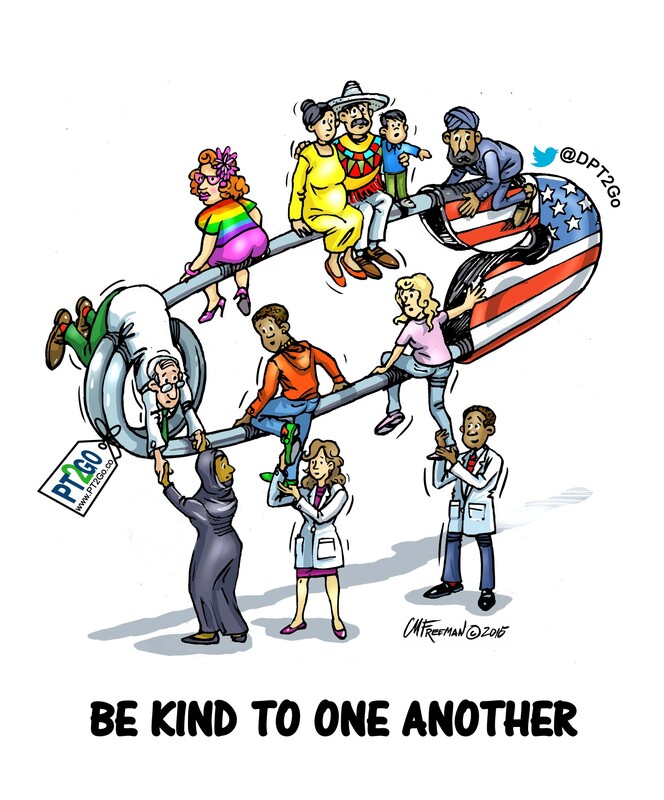 I hope this image resonates with you and your patients to live a kinder and more thoughtful day. In the meantime, tolerate nothing but kindness and love for one another.